Marion N. Seidel’s equestrian journey has traversed two continents and spanned nearly four decades. Born in Düsseldorf, Germany, her love of horses drew her to the race track and as a teenager, Marion became an apprentice jockey. For sixteen years she poured all of her love and passion for the majestic animals and racing, also known as “The Sport of Kings” into her work. In 1992, Marion made a move to Florida and continued working in the field as an exercise rider. It was then that she was presented with a stark contrast of ideology between her home in Germany and of Europe as a whole, and how the Thoroughbred Horse Racing industry was run and operated in the United States. She was confronted with an astounding amount of performance enhancing medication administered to the animals, as well as drug use, and abuse forced upon them by the trainers. Training methods that were taboo in Europe were commonplace in the U.S., and Marion became disenfranchised with the entire structure of the industry. In 1995, she made the decision to step away from the sport and from the animals she loved because she couldn’t reconcile what she saw as abuse. In 2011, Marion earned her Thoroughbred Trainer's License, and it was also the time she felt moved to share her story and lifetime of experience with the equestrian world. Marion has penned three novels since 2013. JUST ANOTHER RACE HORSE, RACE HORSE TRAINING: COMPARED, and FROM RACE HORSE TO TRAIL HORSE TO PET were all published within a year of one another, and showcase the knowledge and insight Marion has earned over almost forty years of working with the animals she loves. Marion has become a champion for Thoroughbred Horses and continues to work with, and care for them today. She hopes to raise awareness and garner compassion for the beautiful animals being abused every day, simply for the entertainment of race fans. Marion’s next novel (Title and Release Date-TBA) is in production and promises to showcase once again her passion for, her love of, and her knowledge about Thoroughbreds and the industry in which many of them in the United States are trapped. Just Another Race Horse is an animal story written by Marion N. Seidel, based on true events as told from the viewpoint of a horse named Sonny. Sonny was not one of the small, elite minority of racehorses that were born to be great and had sterling pedigrees to their name. He was just another race horse; though, as far as he was concerned, Sonny did his utmost to be the best possible horse and couldn't see what more he could be. Since he was not considered a candidate for greatness and had no bloodline worth passing on, he was gelded, and the operation occurred before his body had finished developing properly. Sonny spent his early years as a racehorse. While he tried his best, he wasn't suited for the intensive schedule his owners set for him, and the lack of rest and recuperative time between races made his life one filled with pain, injections of painkillers, and abuse by his trainer and some jockeys. It wasn't until the man who called him Handsome and saw through the misery to the horse inside, that Sunny had a shot at a full and meaningful equine existence. Marion N. Seidel's Just Another Race Horse exposes the harsh and unfeeling attitudes that are all too prevalent in the horse racing industry where owners care more about the profits to be made from racing than their horses' well-being. I was saddened to see how the spirited and willing young horse was transformed through neglect, cruelty and malnutrition into one who feared all human contact and felt the need to defend his food. This is a well-written and knowledgeable story that was penned by someone who was all too familiar with the problems endemic in horse racing and has been part of the solution, at least for those horses lucky enough to be found, rescued and given new lives and homes. While I had been aware that racehorses lived in brutal circumstances, I had known very little about the actual particulars of the situation and appreciated learning more about it from this book. However, what I liked most about Just Another Race Horse was getting to know Sonny and getting a feel for how horses interact with each other and with the humans they encounter. I feel privileged to now have a deeper understanding of these magnificent beings thanks to Sonny's story. Just Another Race Horse is highly recommended. Just Another Race Horse is an animal non-fiction book by Marion N. Seidel. Sonny is a horse that reminisces about his life with heartfelt emotions. He remembered the happy, idyllic times with his mother when he was a foal and the caring treatment from his caregivers on the farm. That contentment was shattered when Sonny grew older and a racehorse owner bought him. He worked extremely hard when training, but it was not appreciated. The abusive treatment Sonny received was not what he was accustomed to and he retaliated in his own way. This only made things more difficult for the yearling. People also thought he was just an average racehorse who rarely won races that should pay for his upkeep. How he wished he could roam freely in the pastures and make friends with other horses. Just Another Race Horse is a poignant non-fiction read that gave me an unexpected view of the other side of horse racing. One usually sees the glamorous side of this sporting event, but Marion N. Seidel writes very descriptively about the actual treatment given to horses by some of their owners. Sonny, an adorable thoroughbred, narrates the story with heartfelt emotions. 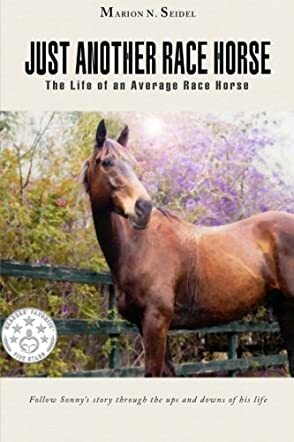 It is a story that made me ponder about the realities of horse racing and the living conditions that a few of these animals endure on the farms where they are raised. The author gave other relevant information about the categories of racehorses and the importance of these animals' birth dates. Just Another Race Horse is an interesting book. Sonny is born at the wrong time of the year and doesn’t have an impressive pedigree nor the necessary qualities for becoming a stakes racehorse. All in all, he’s just an average racehorse; one of the unnoticed 75% or so of horses that have been trained to race but end up earning much less than the cost of their upkeep and training during their careers. Just Another Race Horse by Marion N. Seidel tells Sonny’s story, from Sonny’s perspective. Sonny’s life starts off happily enough with a mother who loves him and people who nurture and care for him, but life takes a startling turn when he’s sold at auction, and suddenly everything Sonny is fed and taught has a purpose – to prepare him for his life as a racehorse. There are now new people in his daily life like grooms, trainers, hot-walkers and exercise riders, but ironically enough, it’s the people who own him that he rarely sees or with whom he rarely has any interaction. Then, with his first race (in which he finishes close to last) come new experiences with jockeys with hard hands and lashings with whips, drug injections, pain medications, and having his tongue tied so that his breathing is more controlled during races. Although Sonny does win some races, none of them are high stakes races with big purses, and eventually the injuries come and with them the pain, further reducing his chances of becoming a prize-winning racehorse. Just Another Race Horse is poignant and at times heart-wrenching, probably more so because the story is told from Sonny’s perspective. Seidel does a great job giving her protagonist life and an indomitable spirit that shines constantly throughout the book. From Sonny’s perspective, we are able to understand and relate to the importance of a kind word and the impact a human’s carriage or demeanor has on an animal’s behavior. More importantly still, Seidel’s book brings awareness of the ugly monetary aspect of horse racing and the exploitation of these animals, all for the sake of an impressive purse. Lacklustre performances and injury will abruptly end a racehorse’s career and, as Sonny’s story quickly shows us, there are certainly significant costs associated with their upkeep, both in labor for the grooms, trainers, hot-walkers and exercise riders, and in food costs, not to mention extensive veterinary and dentist bills. Once it is established that Sonny is no longer a contender on the racing circuit, seemingly overnight he becomes an unnecessary expense to his backyard trainer and, quickly, a victim of neglect. Luckily for Sonny, his story has a happy ending but for the many others like Sonny, their ending is far from happy. Just Another Race Horse is a must-read for all animal lovers.